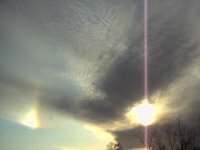 While driving in the chilly early morning from Toronto to Shannonville, as the clouds broke, I spotted a solitary sun dog, left of the sun. 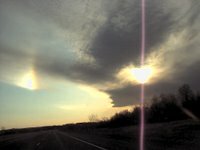 I took 2 digital photos with my Samsung camera... while driving (nervous laugh). This was my first sun dog. The first time I ever observed one. The clouds were too thick to the right to see anything, unfortunately.